This authentic Memphis Tigers XP helmet by Schutt features a traditional standoff helmet shell with a metal faceguard, a complete interior TPU cushioning set complete with TPU jaw pads and ION hard cup chin strap. The XP helmet is Schutt's current state-of-the-art design, engineered to minimize or prevent player concussions. For display only - not to be worn. 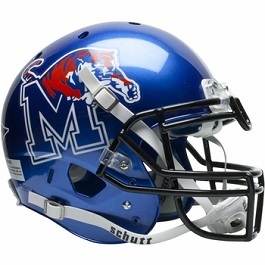 This Memphis Tigers Chrome XP Helmet by Schutt is available in both Authentic and Replica versions. 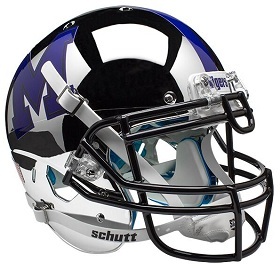 Both feature a silver chrome streamlined AiR XP shell, a polyvinyl-coated steel facemask, a 4-point ION hard cup chin strap and official Memphis helmet decals. The Authentic version includes a complete, authentic interior TPU cushioning set with TPU jaw pads. The Replica just has the TPU jaw pads. For display only - not to be worn. Fully licensed and made in the USA. 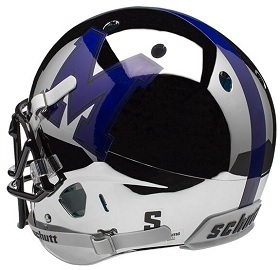 ** Note: other than the "M" decals and center stripe, the helmet is all chrome ... the dark areas are just reflections. Authentic: $239.95 ..... Replica: $149.95 - both with Free Shipping! This University of Memphis Tigers Alt. 2 Black XP Helmet by Schutt is available in both Authentic and Replica versions. 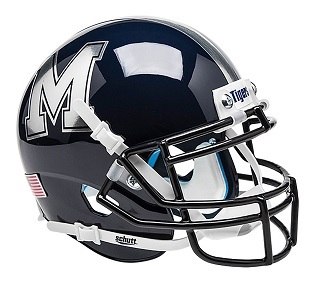 Both feature the streamlined AiR XP shell, a polyvinyl-coated steel facemask, a 4-point ION hard cup chin strap and official Memphis helmet decals. The Authentic version includes a complete, authentic interior TPU cushioning set with TPU jaw pads. The Replica just has the TPU jaw pads. For display only - not to be worn. Fully licensed and made in the USA. This University of Memphis Tigers Alt. 2 Matte Black XP Helmet by Schutt is available in both Authentic and Replica versions. Both feature the streamlined AiR XP shell, a polyvinyl-coated steel facemask, a 4-point ION hard cup chin strap and official Memphis helmet decals. The Authentic version includes a complete, authentic interior TPU cushioning set with TPU jaw pads. The Replica just has the TPU jaw pads. For display only - not to be worn. Fully licensed and made in the USA. 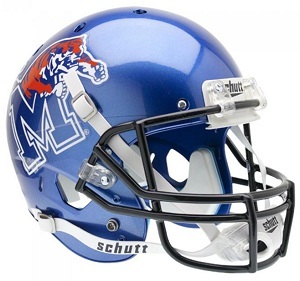 This is a full-size replica of the authentic Memphis Tigers XP football helmet by Schutt. 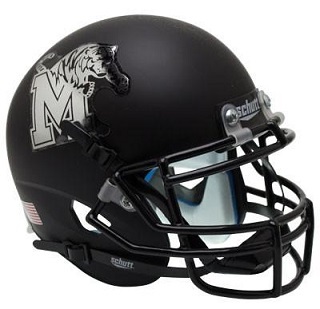 It features an authentic steel faceguard, 4-point chinstrap and official Memphis helmet decals. It does not include the authentic interior padding ... just TPU jaw pads. For display only - not to be worn.